This is not the latest figure for clinically obese teenagers in Nebraska, nor is it the cost, in dollars, for a bedsit in Stepney. This is the name that Texas based company Rice-Tex gave to Basmati rice in 1997, after they had patented it. Overnight this exotic and desirable product from a geographically niche part of South-East Asia was now the creation of a failed Texan biology teacher, its origins rendered irrelevant. Cava could suddenly lord it as champagne. But once the rural outrage and fear hit boiling point, in came a legion of besuited litigators to untangle a yarn of bio-piracy, decipher the salience of a thousand year legacy of intricate farming techniques and ultimately prevent someone who couldn’t even pronounce it properly from leaning over a Petri dish and exclaiming the word ‘basmati’. One wonders though, away from the swashbuckling extremity of biological infringement, has the global food spectrum, much like the political, merged in the middle? Is the regional resonance of Basmati still of upmost importance in how we view rice? Is chicken Tikka Masala an English dish? Or Scottish? Do we even know or care? The word ‘pizza’ was first used in Boston at the turn of the 20th Century yet surely the first thing cavemen did after creating fire was harness some sort of pizza oven? Ultimately, isn’t all food some sort of plagiaristic ode to a technique overheard through a culinary eavesdrop? In light of the emergence of the above conjecture, what we have now seen is restaurants and indeed whole food genre’s taking back their identity, their history, their geographical partition. If you want Chinese food, or Indian food, eat the food of my forefathers, not some pan-fried chicken dipped in a tub of Onken yoghurt and dyed pink. 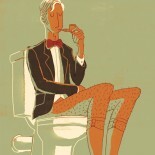 And so, to try and understand what ‘from over there’ looks like ‘here’, the Porcelain Gentleman headed to Dishoom. 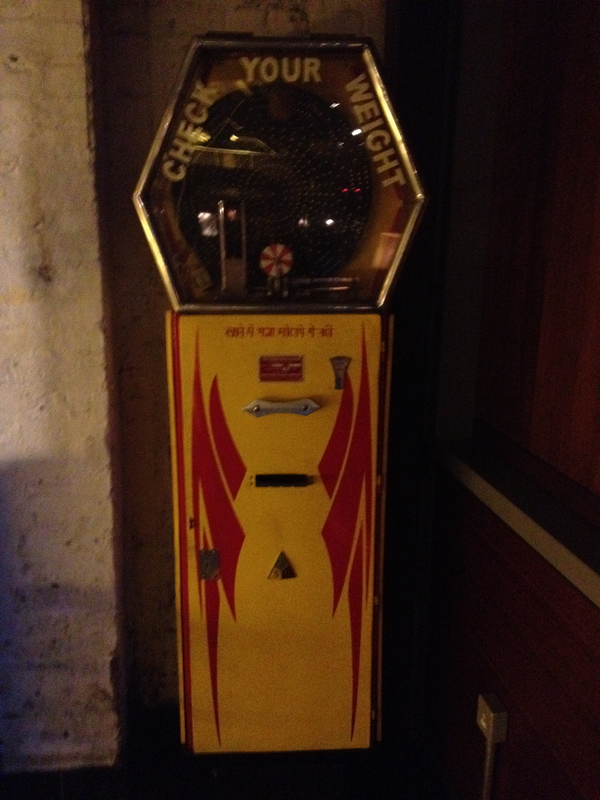 On first entry into Dishoom, I scanned the décor and was pitched head-first into a whirlpool of over-thinking. 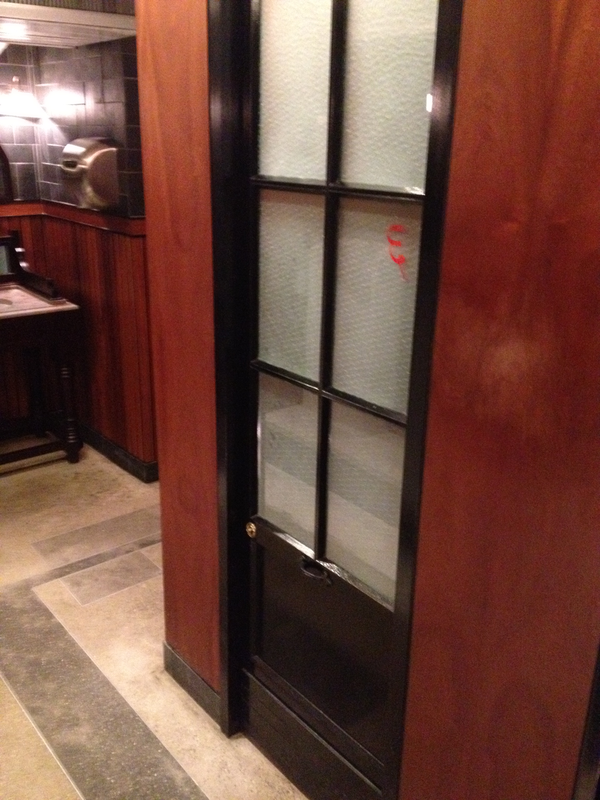 The standard British curry house, with its terrible airport lounge art, bright white table linens and plates piled with poppadoms was, one assumes, originally based upon what the Asian population thought Westerners wanted, or at least could handle given our rearing on excessively boiled veg, overcooked beef and penchant for the clothed table. 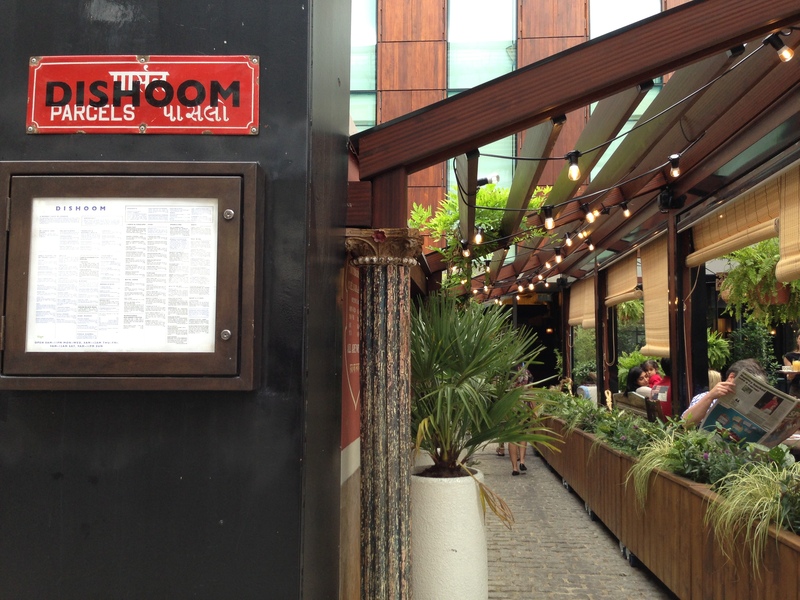 Dishoom however, is the antithesis of this sentiment, perfectly embodying how Westerners imagine the Asian population eat, or perhaps, in a cultural exchange of arch post-modernity, how Asian people assume the Westerners assume the Asians eat. Confused? So was I. But get too bogged down in the vortex of imagined cultural representation and interpretation and you might miss the actual point, which is to embrace the cliché, indulge the generalisations and understand that globalisation, for all its faults, has at least taken things such as colonial patronisations and turned them back on the perpetrators. 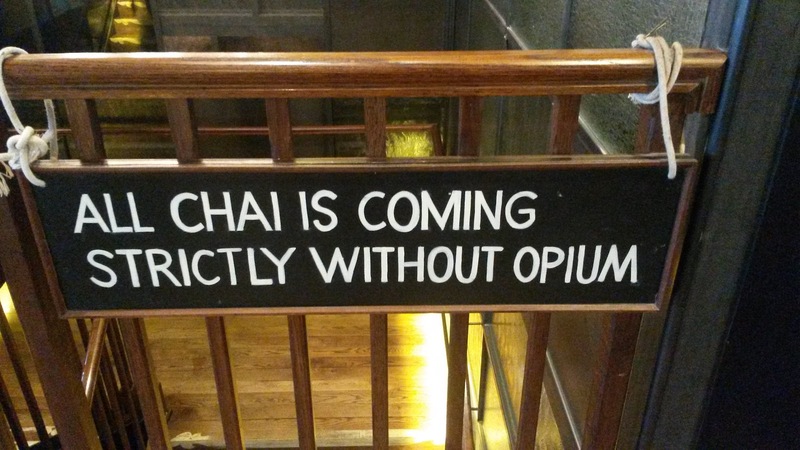 After all, laugh as the West may at the twee nature of the developing world, how it (or, at least, its metro-liberal elite) would love to deploy genuine signage refuting the opium content of its favoured libations, without breaking numerous archaic prohibition laws or just looking unbearably naff. 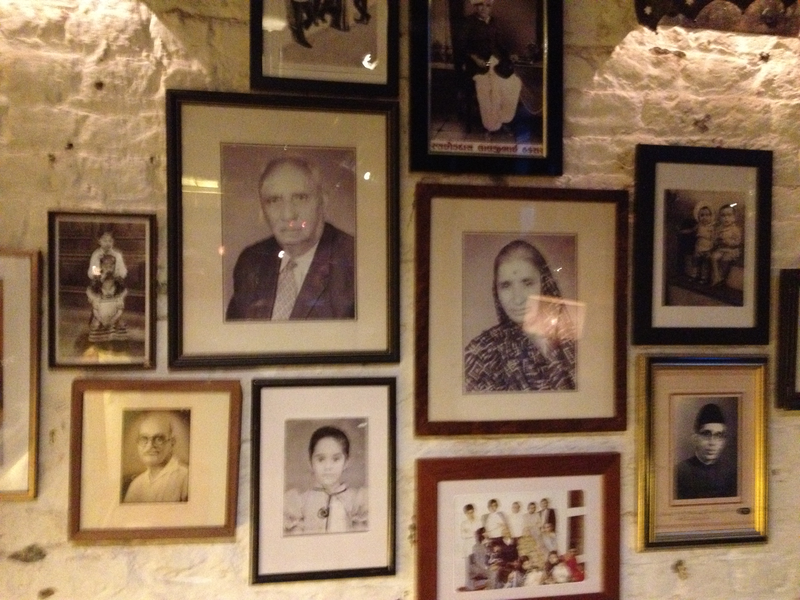 The hotchpotch of pictures of the family who run the place may seem a throwback, yet this now represents a badge of honour common to a new wave of restaurants adorning trendy streets across the land, as the discerning consumer increasingly seeks to distance themselves from the faceless monotony of the franchise. Now yes, it is all a bit Disneyworld but (without wishing to steer my analysis in the direction of some obligatory, lazy epiphany as is common to most modern journalistic prose) all of modern life is a bit Disneyworld. But at least now we are seeing some reclamation over how a culture is perceived by those who reside in it as opposed to those who simply write about it. As for all the grey areas around the fringes? 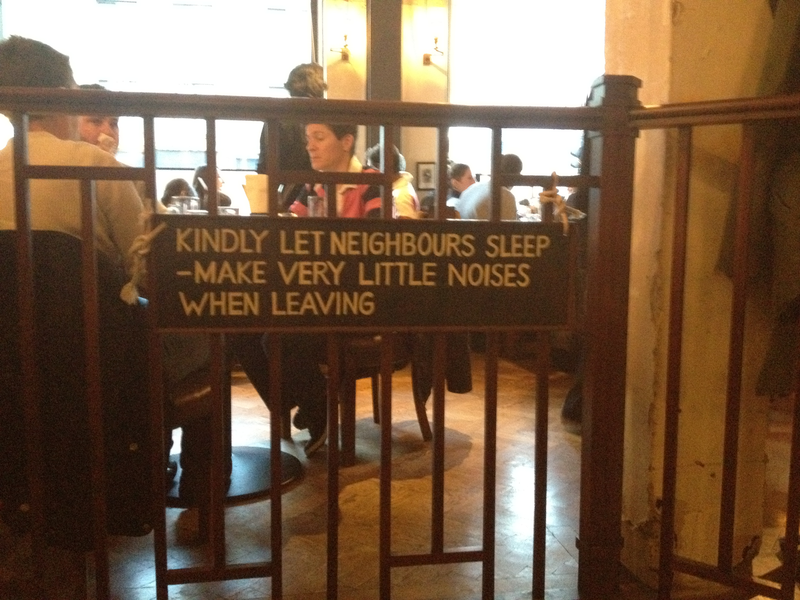 Well, best just keep quiet. 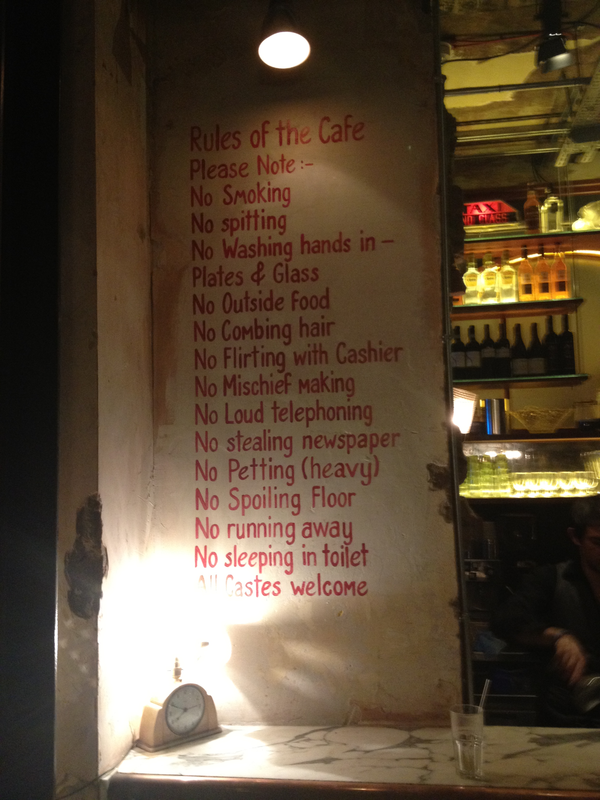 We can’t be sure whether colonial Indian restaurants served mojito’s at the turn of last century, but why would anyone choose to rock the boat? 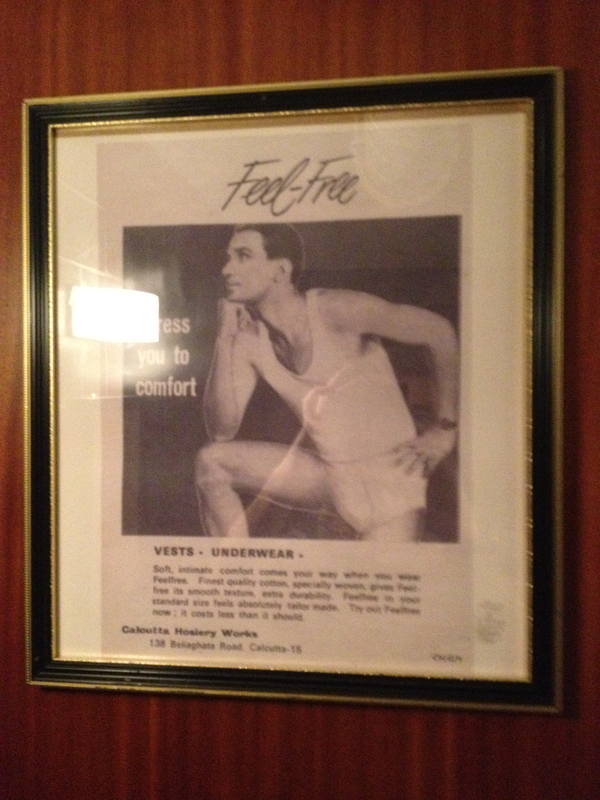 The food and décor may be well thought out and executed with a pinpoint degree of conviction, but it is in the toilets where this establishment truly excels. 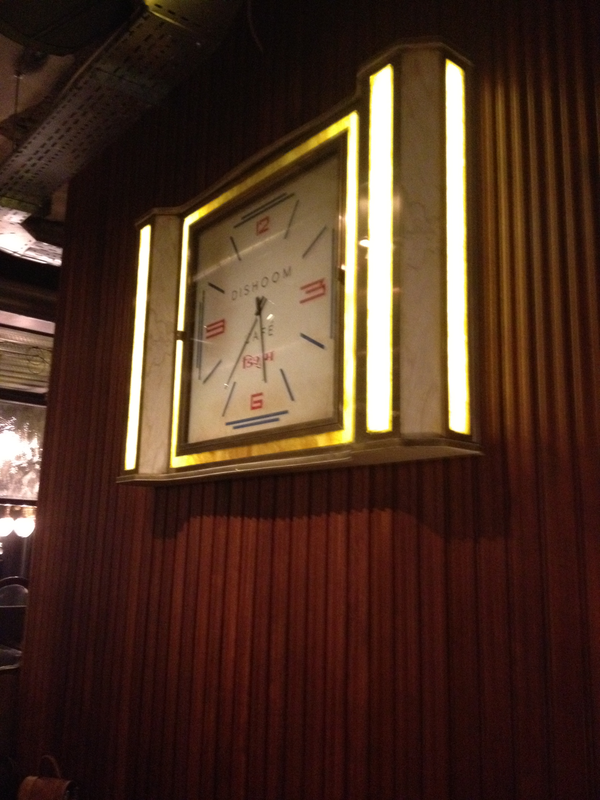 The attention to detail and restoration of toiletry timepieces is exquisite. 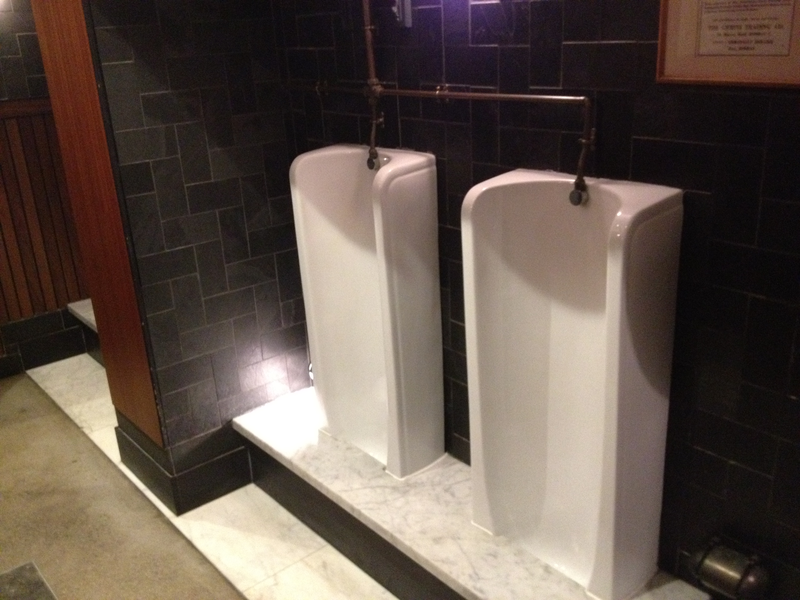 The first thing one notices upon entry if the restored urinals that are framed with a marble step. 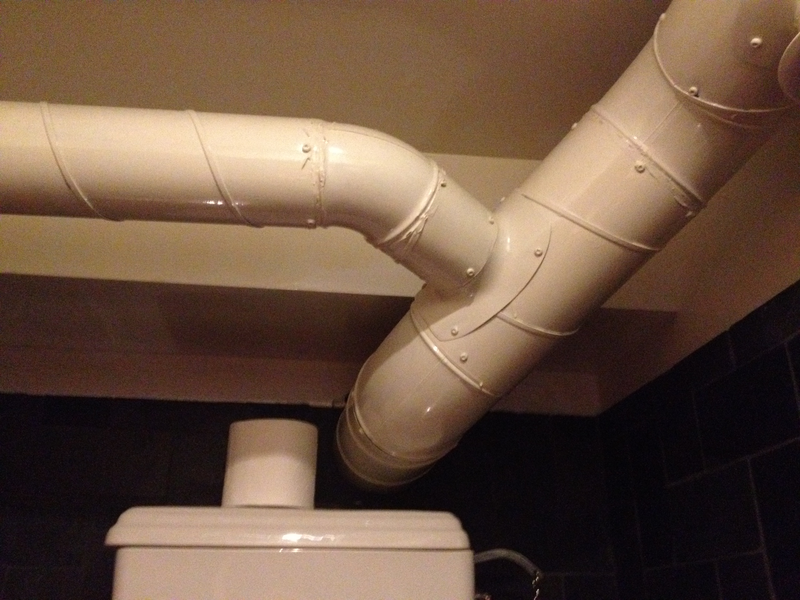 These are surrounded by original pipework that has been developed with an eye to ensuring a fascia of cleanliness, whilst also paying requisite attention to the fact that such techniques of pipe welding were used in a manner that was specified to last, as oppose to modern day plumbing techniques which work like some leaky panhandler always accosting you for more money as they fail to deal with even the slightest climatic variance. 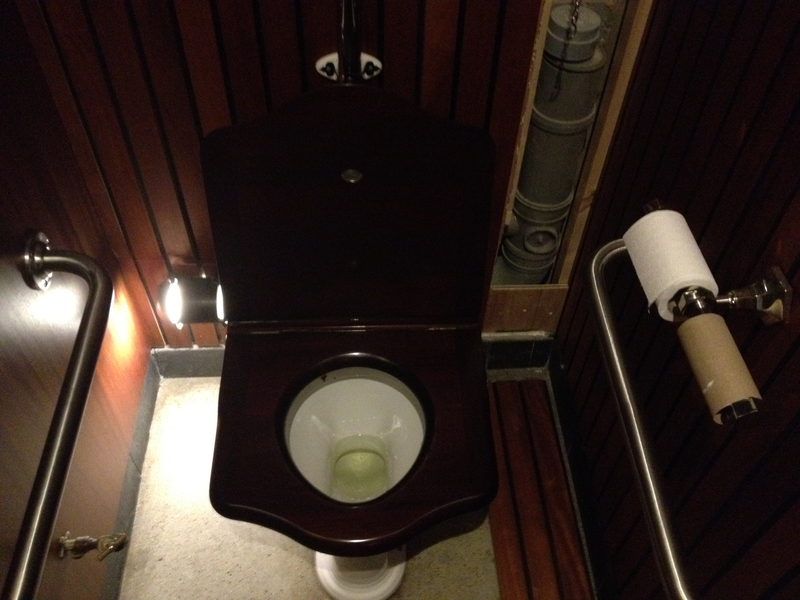 The stalls themselves are a living museum in terms of veneer and aesthetic, whilst also a timely reminder to how golden the Victorian age was in sanitation advancement and creativity. 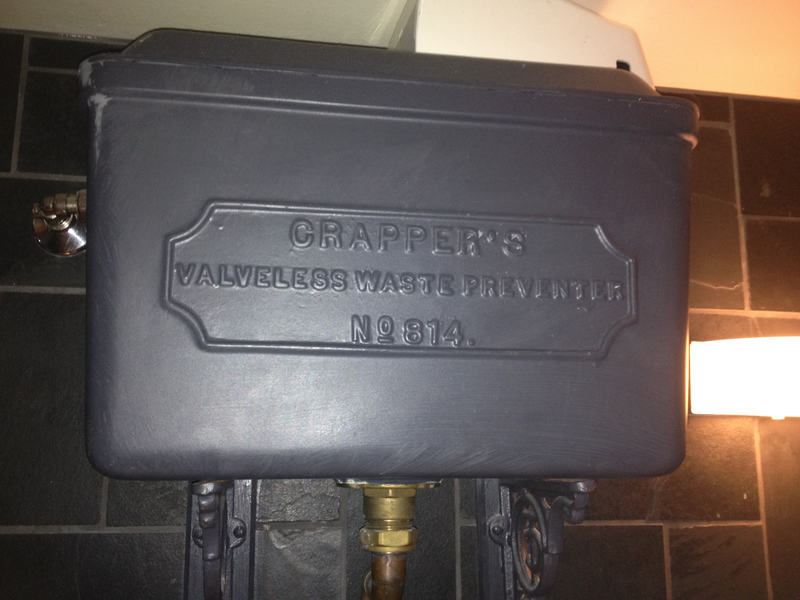 Original ‘Crapper Valveless Waste Water Preventers’ are restored to former glory and utilised throughout. 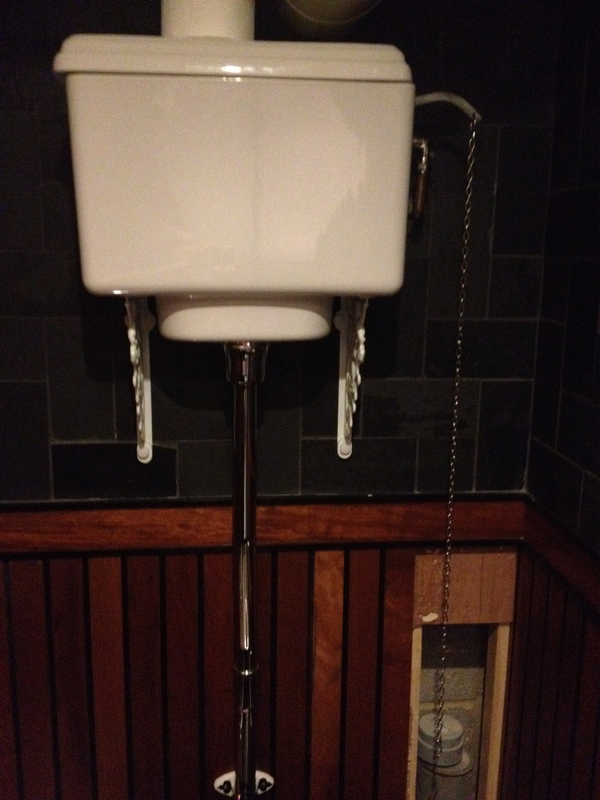 Pulling the chain and passing one’s own kinetic energy onto the flushing procedure like a relay baton exchange brings a level of humility to the world of sanitation lost in an era of push buttons, or worse, movement sensors, that never quite work out if you have vacated so seem to continuously flush as if the poor robotic mind has ADHD or is in the midst of a seizure. 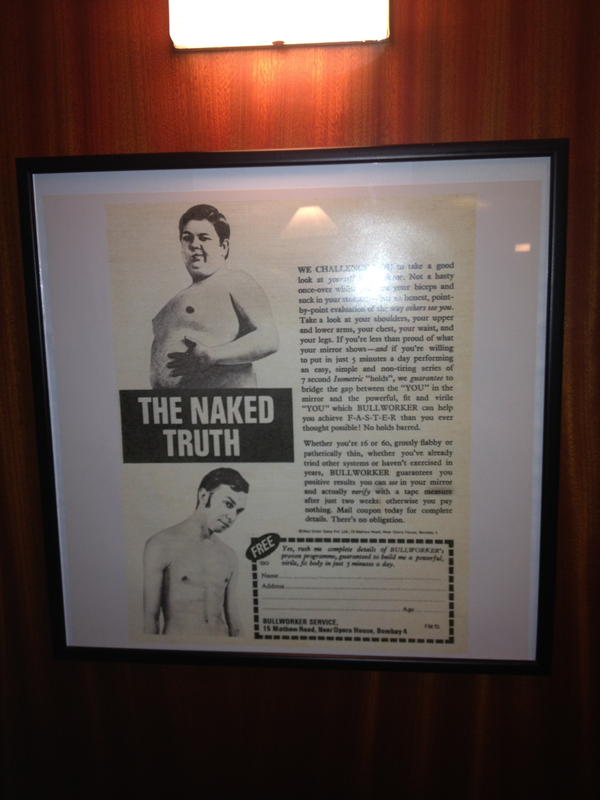 The imagery on the walls is a playful reminder of the world of advertising before it become cryptic nonsense, spending millions on making you love the brand, tenderly caressing you through the night before leaving you cold, alone and skint the next day. These old references make you wistful for a time when you could recall knowing what product you were being sold. But the inner child in all of us will be drawn to adverts on piles as we chuckle through the disgust at their timeless comparison to the grape (bunched). 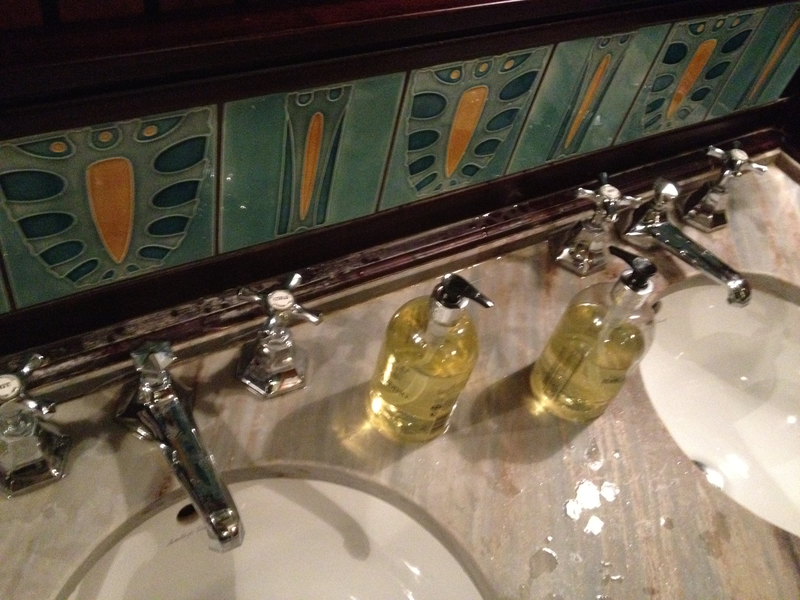 Needless to say this journey of historical reverence ends perfectly with the wash basin. 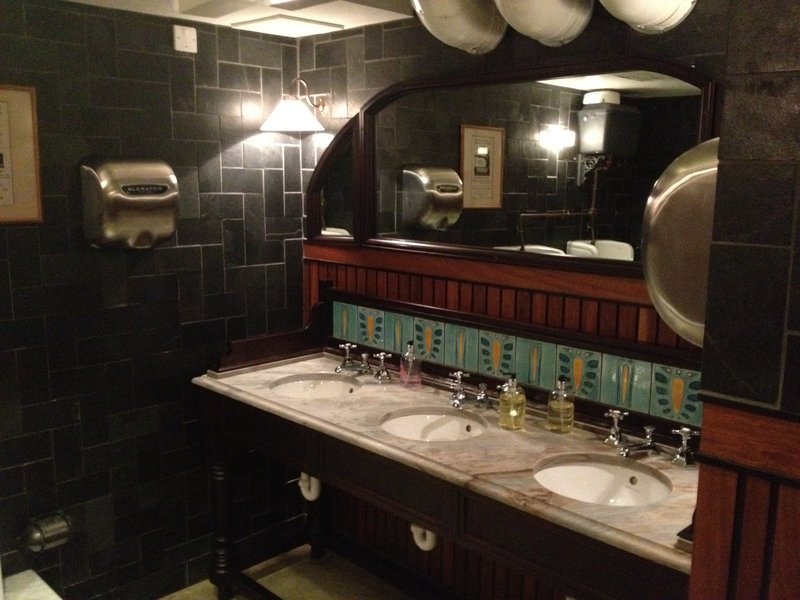 Exiting the toilets, which adopt classically Victorian England décor and relics of British engineering feats, you are reminded that this is in fact an authentic Indian experience. 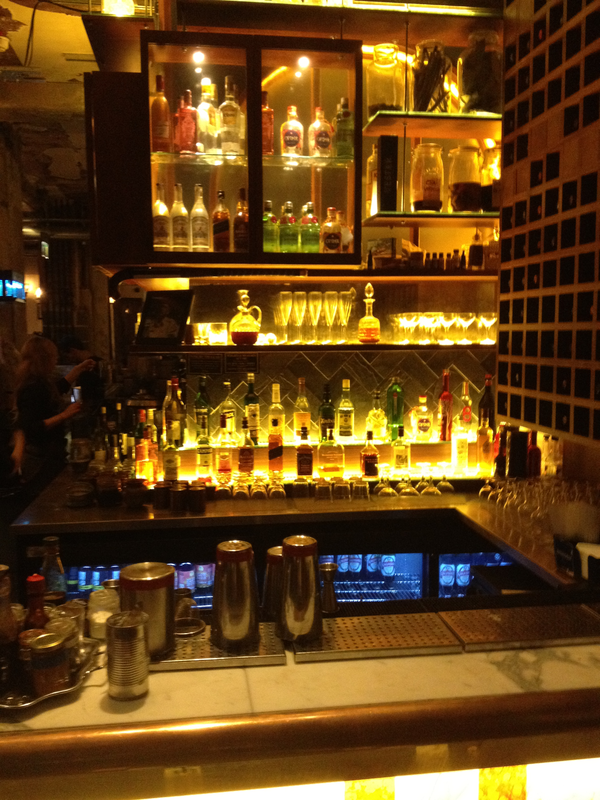 And then it hits you; indulging in the cliché and the stereotypes is not an issue, as long as it is done right. 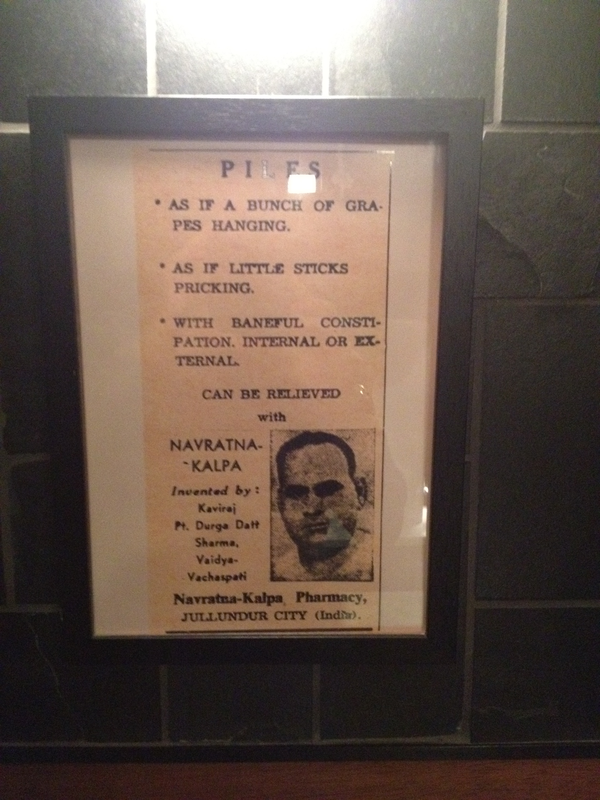 The valveless Crapper and the Hindi signage didn’t clash, they complimented, because due care was given to what they were in their marvellous originality, as opposed to pandering to what anyone thought they were or assumed they should be. 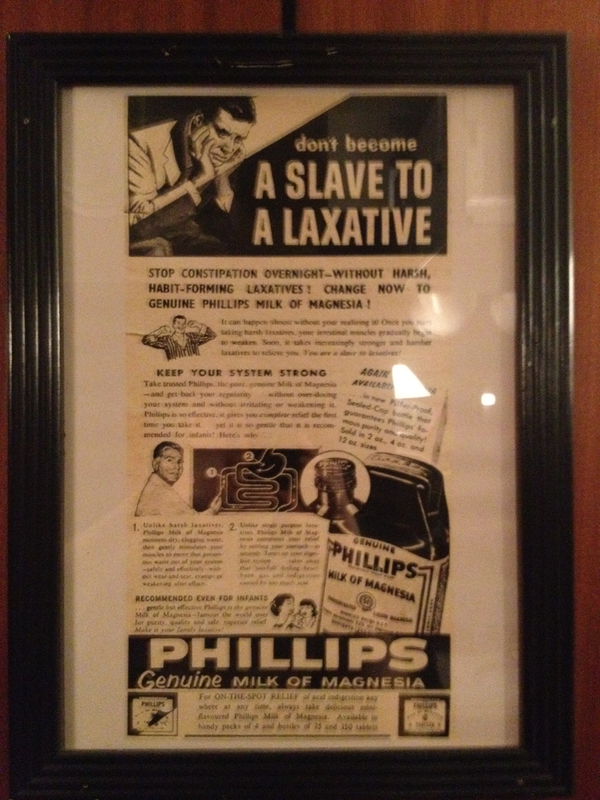 This entry was posted on December 13, 2013 by alfielay in Restaurants.